A very wet Friday here, but the weather has not prevented more Palestinian Arab terrorist attacks on Israelis. There has been a stabbing assault in the Sha'ar Binyamin area on Jerusalem's northern edge. An Arab knife man, who managed to flee, stabbed an Israeli male in his (more or less) forties outside the Rami Levy supermarket branch in the Sha'ar Binyamin Industrial Zone. The injuries are serious: wounds to the upper part of the body. (Please pray for the recovery of Shmu'el Ben Chava.) The attack happened at roughly 1:30 pm this afternoon. IDF forces are currently in pursuit of the terrorist. Times of Israel reports that minutes before that attack, a Palestinian Arab woman tried to run down a cluster of IDF soldiers at Halhul Junction, near Hebron. (We wrote about another ramming attempt at about the same place yesterday, here.) She failed, and was shot by soldiers. Israel National News reports that she is - startlingly - 72 years old. Other than the attacker herself, no one was hurt. She was taken to a Jerusalem hospital for emergency Zionist medical treatment for the injuries she suffered when being shot. 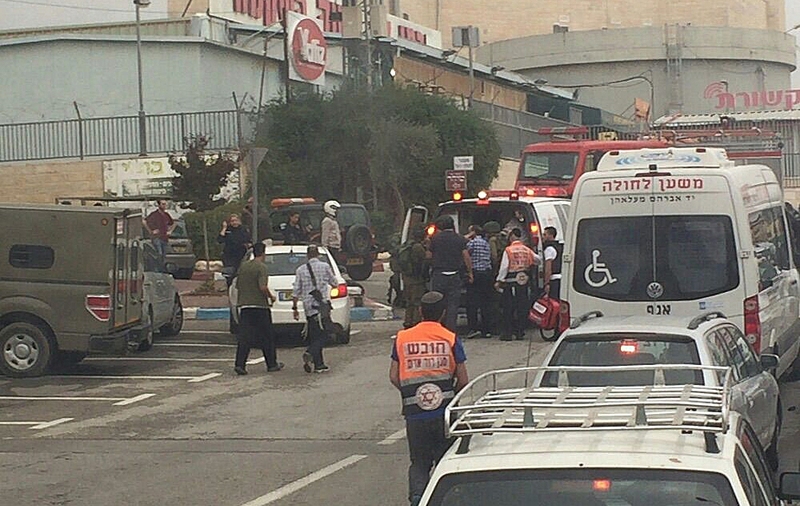 The Ma'an News Agency, based in Bethlehem, says she died of her injuries at Shaarei Zedek Medical Center. This might be true. It names her as Sarwa al-Sharawi and says her husband, Fouad, "was killed by Israeli forces during the 1st Intifada".